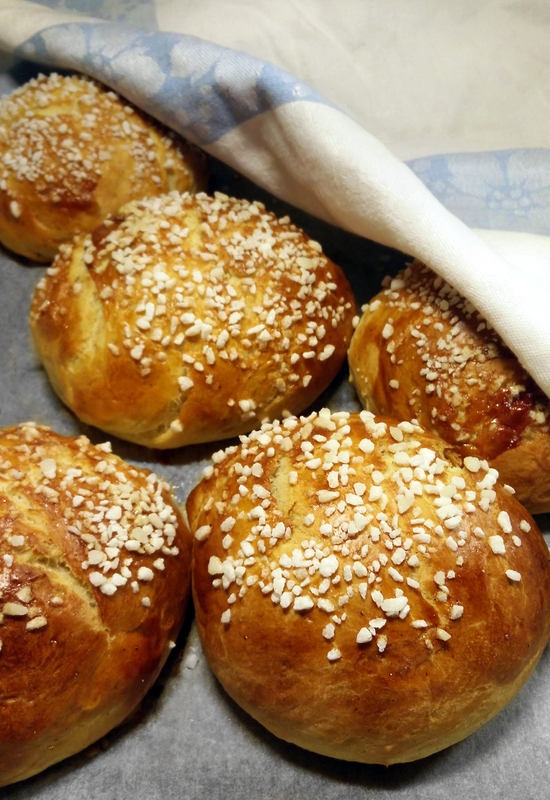 These sweet buns are traditionally eaten either with a jam or marzipan filling. I got a box of frozen cloudberries from my landlord and decided to make cloudberry jam to fill the buns. That way these sweet buns turned out to be sort of a Lappish version of the traditional laskiaispulla combined with the bun-baking knowledge of my grandmother. Even though it might sound like it, Laskiainen is not only about eating but having a good time sledding with friends! This year, instead of going downhill sledding I went dogsledding! Early afternoon we did a quick training session with inexperienced wolfdogs. 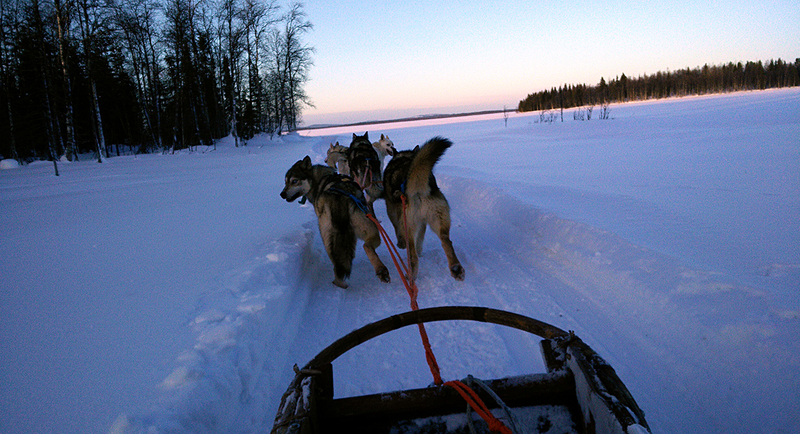 I was just sitting in the sled enjoying the view, holding a dog leash in case that the least experienced wolfdogs of the team couldn’t handle it. Luckily for me (and the dogs of course), they did quite well and no one had to walk back home. In the afternoon it was time for coffee and delicacies. And in the evening, Northern lights. That’s what I call a perfect day. Crumble the yeast in warm water (37°c) and stir well. Mix in the salt, egg yolk, cardamom and sugar. Start adding the flour little by little, stirring constantly until the dough starts to get a kneadable, soft consistency and you can start kneading it by hand. Knead the dough for 5 minutes, adding more flour if it gets too stuck on your hands. At the end of the kneading process, knead in the little, room temperature pieces of butter. Cover the bowl for half an hour and let the dough rise. Turn on the oven to 225°c. Divide the dough in half and on a floured surface, roll the pieces into long, approximately 5cm thick bars. Divide each bar into 5x5cm pieces and roll them into round buns between your palms. Place the buns on a baking sheet, leaving a couple of centimeters of space in between individual buns. Cover the buns with a kitchen cloth and let them rise for 15 minutes. Before baking, brush them with egg white and sprinkle hale sugar on top. Bake until they’re golden brownish on top. Let them cool well before cutting them in half and filling them with cloudberry jam and whipped cream.